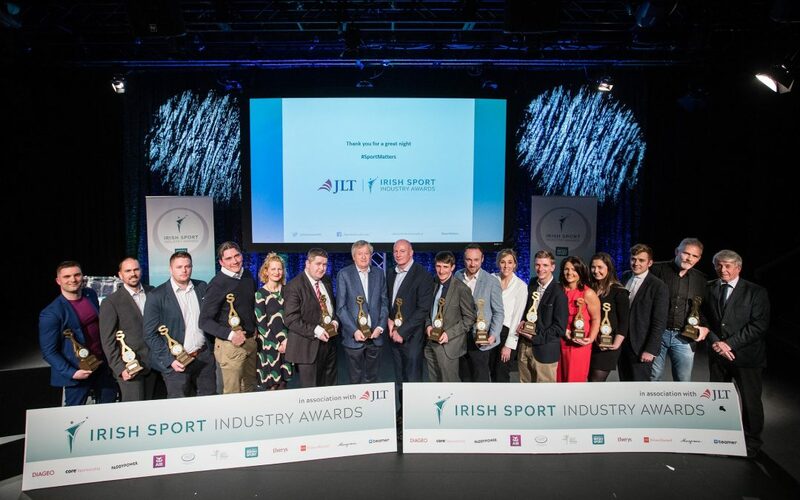 Thursday, 8th March 2018: In an apt turn of events, The Federation of Irish Sport has revealed that female sports took home the top prizes at last night’s (Wednesday) annual Sport Industry Awards, in association with JLT Ireland. Celebrating today – on International Women’s Day – will be Lidl and the Ladies Gaelic Football Association who scooped the accolade for Sports Campaign of the Year, while the IRFU was awarded Sports Event of the Year for the Women’s Rugby World Cup hosted in Dublin and Belfast last year. Both were praised for their considerable investment in raising the profile of women’s sport. GAA Director General Páraic Duffy, who is due to step down later this month after 10 years of service, was awarded an Outstanding Contribution award alongside the O’Donovan brothers’ coach Dominic Casey who also received an Outstanding Contribution award for his considerable involvement in Irish rowing. AIB has long been paving the way in sport sponsorship and 2017 was no different. The long-term GAA sponsor went home with Digital Engagement Community of the Year for its 12-month long Club and County #TheToughest campaign which received over 20 million views and 4 million social interactions. The FAI has a history of developing specific programmes for people with disabilities, for asylum seekers, ethnic minorities and refugees. In 2017 the Association agreed to work with Cara on a five-year programme that will ensure diversity and inclusivity in all the Association does earning them the Diversity and Inclusion award. Other winners on the night included Gymnastics Ireland who took home National Governing Body of the Year, Cork LSP won Local Sports Partnership of the Year, AIG and Dublin GAA scooped Best Commercial Sponsorship and Fota Island Adventure beat off stiff competition to take Sports Business of the Year. Sporting Innovation of the Year was deservedly collected by the Dublin Simon Community. In the belief that homeless people need and deserve more purpose, wellbeing, intellectual stimulation, self-esteem and independence, they set up “The Wellbeing Room”. The gym which allows vulnerable adults to focus on their physical and mental health in a fun way has been a huge success – even allowing one individual of playing for Ireland in the Homeless World Cup. The final two awards were the Jimmy Magee Award for Sports Journalism and Sports Media Outlet of the Year. The media plays a pivotal role in the business of sport and we in Ireland have always had both great journalists and media houses. The Federation would not however presume to be the best judge and so entered into partnership with the Association of Sports Journalists in Ireland (ASJI) to select the winners. A superb and fearless writer, Vincent Hogan of the Irish Independent was honored with the Sports Journalist of the Year award. And OffTheBall.com was awarded Sports Media Outlet of the Year in recognition of its contribution to the Irish sporting landscape, continuing to go from strength to strength, and embracing all forms of communication from broadcast to digital.